There it goes - at one of the points where I'd used a drill bit to break the copper track I hadn't quite broken it completely. 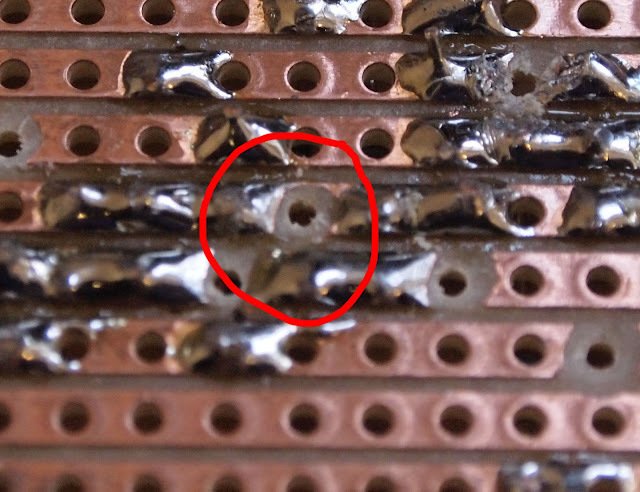 Those holes are 2.54mm apart so the bit of copper that was left couldn't have been much more than 0.2mm wide, but it was enough for electrons to squeeze through and stop it producing any sound. Once that and several other problems were sorted, I brought it home and tried it out. It doesn't sound exactly like the original, but it has a nice tone with loads of gain. Hopefully this week I'll put it in a nice enclosure.